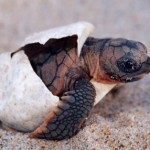 Now through September, loggerhead turtles emerge from the sea and lay their eggs on the beach. One of the best ways to watch this fascinating ritual is on an evening Turtle Walk at MacArthur Beach State Park in North Palm Beach. Itâs one of the few places in the county where you can observe loggerhead turtles up close and rest assured that youâre not disturbing them because a trained park ranger will accompany you. The evening events start at 8pm (Monday, Wednesday, Friday) in the nature center with a movie about turtle behavior, why itâs important to wear dark clothing only, and how best to watch the loggerheads. Then, itâs off to the boardwalk on the beach. When a turtle crawls ashore and begins to lay her eggs, you can approach with the ranger to watch the eggs drop. The loggerhead is the most common sea turtle in Florida and is named for its large head. Adults can weigh as much as 350 pounds, and each nest contains well over 100 eggs. To reserve a spot on one of these Turtle Walks, call 561-624-6952 or go online www.macarthurbeach.org. Tickets are $10 and limited to eight people per walk.